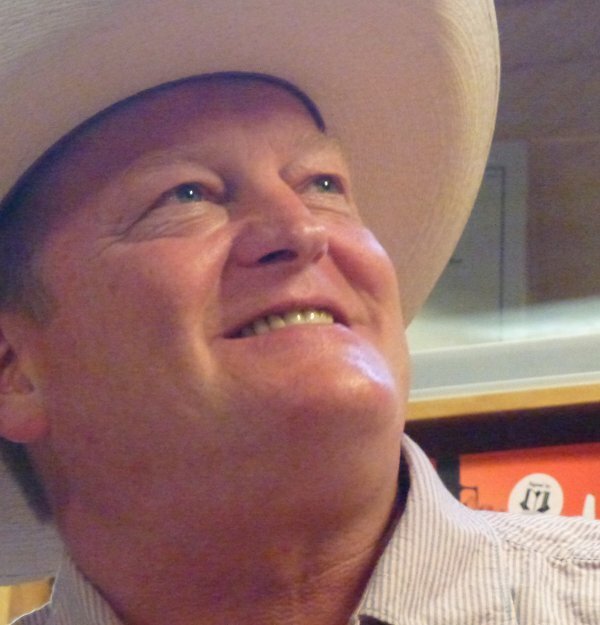 @ The Poisoned Pen with Craig Johnson! As soon as I learned Craig Johnson, all-around good guy and author of the Sheriff Walt Longmire mystery series, was going to be at The Poisoned Pen, you'd better believe I marked June 12 on my calendar. Bold. And all in caps. Johnson has been on my "auto-buy" list since his first book, The Cold Dish. When I told Denis he was coming here to the Valley, he quickly marked it on his calendar, too-- and I wouldn't be a bit surprised if his entry was all in caps and bold as well. 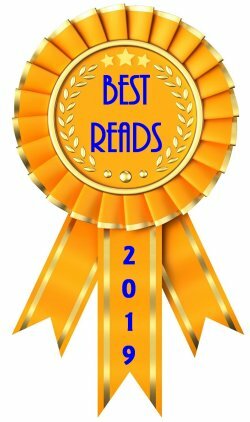 Both of us wish the man could write faster, and I'd made sure that one of my birthday gifts to Denis was the audio version of A Serpent's Tooth, the latest in this marvelous series. About a week before Johnson's visit to Arizona, the thought occurred to me that Denis and I had better leave even earlier than usual to get to the bookstore in plenty of time to get first dibs at the seats. I had a feeling that the popularity of A&E's television series, Longmire, was going to swell the number of fans who'd beat a path to 4014 North Goldwater Boulevard. When you get a feeling like that, go with it. By the time Johnson made his appearance, it was standing room only at my favorite bookstore. If any more people had shown up, we would have been packed in like sardines. Barbara Peters began to tell us some news, believing that Craig hadn't arrived yet. But there he was, way in the back of the crowd. Squeezing his way through, he got to the front, pulled a copy of A Serpent's Tooth out of his bag and showed us that the cover matched Barbara's blouse. Earlier in the day, Johnson had been in Tucson, and "it was mobbed." He told us of a recent signing at Collected Works in Santa Fe, New Mexico, where the entire cast of Longmire showed up-- except for a tardy Robert Taylor, the man who portrays Walt. Craig looked at the crowd and explained, "You see, Walt's biggest adventure is finding parking in Santa Fe." All filming for the television series is done in the Santa Fe area. The weather in Wyoming refuses to cooperate with the film schedule, and the state of New Mexico has done a superlative job in enticing film companies to work there. However, if you watch an episode and see mountains, those are the Big Horn Mountains of Wyoming, courtesy of Photo Shop and other computer magic. Johnson is sent episode synopses and then full episodes, which he line reads for any mistakes. It's obvious that he's been asked hundreds of questions about the television series, because he told us dozens of goodies about it. For one thing, he's been asked over and over again when viewers will be able to see Virgil, a character that shows up in several of the books. Johnson asked the same question to the series' producers, who threw up their hands and said, "Don't ask for Virgil! We can't find an Indian who's 7 foot 2." Another thing the producers are doing is basing episodes on the books, but changing the endings. That way, a couple can't sit back, watch the opening scenes and tell the spouse, "Oh yeah, this is the one where...." It also has another benefit: the books won't be ruined for people who haven't read them. Johnson isn't the only person who appreciates the producers' care and thoughtfulness in putting the television series together, let me tell you! A familiar scene lately is someone walking up to Johnson and telling him, "I'm really sorry, but I didn't know about your books until I watched the TV show!" Craig doesn't mind a bit. "You finally get a tree and what do you do? A while back, Craig read an article about lost boys showing up in places like Gillette, Wyoming and Rapid City, South Dakota. These boys are between the ages of 13 and 15 and have been thrown out of polygamist groups so that the older men retain first choice of the marriageable young girls. That one article planted the seed of an idea that grew into A Serpent's Tooth. Another article he read was about a man in the Salt Lake City area who also belonged to one of these polygamist groups. He was building thirteen space ships in his backyard so that he and his family could be taken up into space at the Final Judgment. The space ships were all different shapes and sizes. 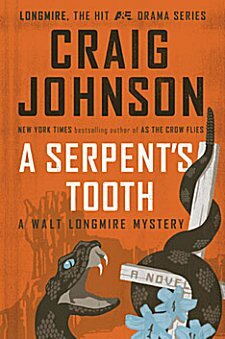 In A Serpent's Tooth, Johnson has Walt pick at some caulking that the man's used in putting together his spacecraft. When told that he uses the most expensive caulk from Ace Hardware, Walt looks at him and nods. "I've found that the extra dollar a tube is always worth it," Walt replies. Holding up a copy of his book, Johnson pointed out the image of Wyoming's Teapot Dome on the cover. (Does that sound familiar from history class?) 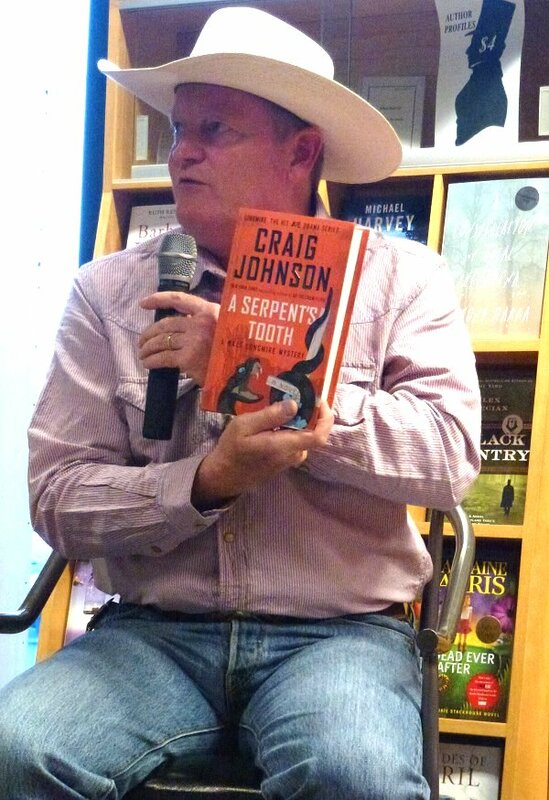 When someone in the audience asked about the rattlesnake that graces the cover, too, Johnson looked at it and said, "Ah yes, the blue-eyed rattlesnake. I personally haven't seen one, but several women have told me that they've dated one." Johnson then told us that his next appearance at The Poisoned Pen will be Saturday, October 26, for the release of his novella, Spirit of Steamboat. 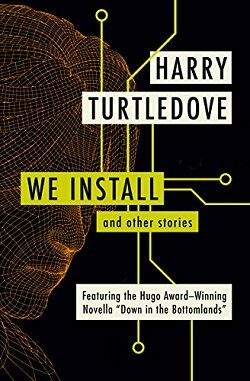 He's been writing short stories (he calls them "connecting tissues") in between his novels. When his publisher called and asked him about his next short story, Johnson told him that it was more than a short story-- about half the size of one of his books, as a matter of fact. He then proceeded to tell us about what we already wanted to get our hands on. We were all spellbound as he told us... so quiet that you could've heard a pin drop across the street. All I can do is copy and paste the novella's synopsis from Craig's website. If you don't agree that "Steamboat" sounds absolutely marvelous, then I'm going to wonder about you! 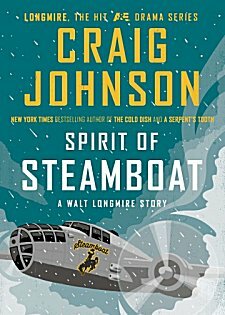 Sheriff Walt Longmire is reading A Christmas Carol in his office on December 24th when he’s interrupted by the ghost of Christmas past: a young woman with a hairline scar across her forehead and more than a few questions about Walt’s predecessor, Lucian Connally. Walt doesn’t recognize the mystery woman, but she seems to know him and claims to have something she must return to Connally. With his daughter, Cady, and his undersheriff Vic Moretti in Philadelphia for the holidays, Walt is at loose ends, and despite the woman’s reticence to reveal her identity, he agrees to help her. At the Durant Home for Assisted Living Lucian Connally is several tumblers into his Pappy Van Winkle’s and swears he’s never clapped eyes on the woman before. Disappointed, she whispers “Steamboat” and begins a story that takes them all back to Christmas Eve 1988, when three people died in a terrible crash and a young girl had the slimmest chance of survival . . . back to a record– breaking blizzard, to Walt’s first year as sheriff, with a young daughter at home and a wife praying for his safety . 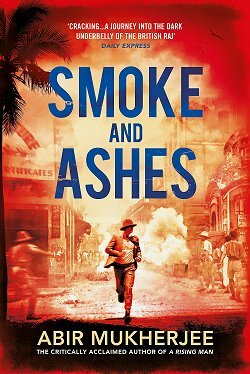 . . back to a whiskey-soaked World War II vet ready to fly a decommissioned plane and risk it all to save a life. Back to the Spirit of Steamboat. Three guesses and the first two don't count as to where I'll be on October 26! Johnson finished up book talk with two tidbits. 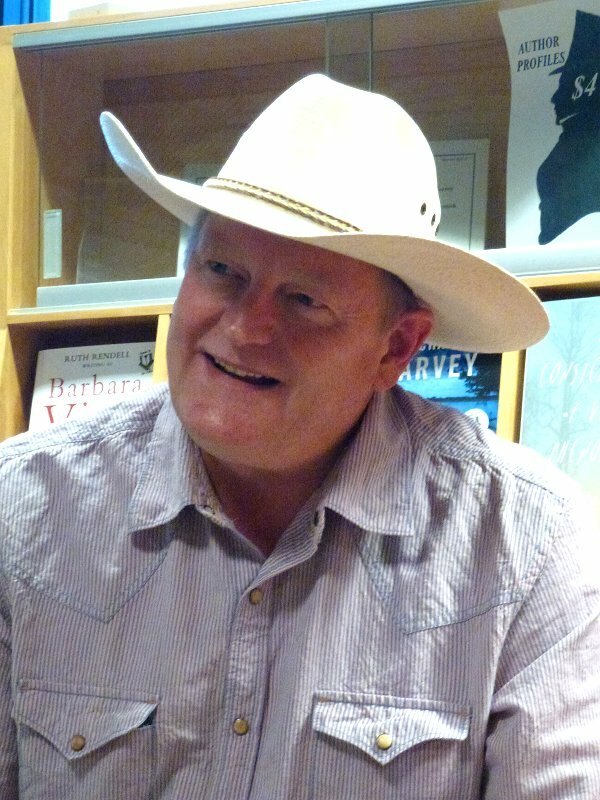 The character of Walt Longmire is a compilation of two men that Craig knew who were at different periods in their lives. And what about curmudgeonly Lucian Connally? "Lucian Connally is my dad, plain and simple. I handed the first finished manuscript to my brother to read, and when he gave it back he said, 'You're dead.' "
"...gerbils with a thyroid problem." Longmire fans in the audience wanted to know more about the series, and Johnson was happy to oblige. "What makes for a good book doesn't necessarily make for good TV," Johnson said. "I know that Hollywood normally has the attention span of gerbils with a thyroid problem, but I'm really pleased with what they've done. My priority is visibility for the books... to get them in people's hands." Craig earned a degree in writing plays because he wanted not only to learn how to write dialogue, but also to learn how to differentiate each character's voice. "What I have trouble with in a lot of books," Johnson said, "is that all the characters sound alike." There have been times that he's wanted to call up the television folks and argue with them about something, but when he does feel that way he remembers that he is pleased with what they've done, so he sits down and has "a big steaming cup of shut-the-hell-up." To the delight of us all, Johnson informed us that the TV series will gradually work in several of the characters we've grown to know and love in the books. And Lou Diamond Phillips, who portrays Henry Standing Bear, is really campaigning to have Henry's vehicles show up in the series. Asked if the French still love him, Johnson admits that-- although he doesn't understand it-- yes, the French are still nuts about him. He made mention of something he calls The Judy Johnson Parisian Shoe Fund, to which his wife replied, "I am no longer amused." When it was all over, we put up our chairs and formed a very long line to get our books signed. Since I bought my book before they were handing out numbered slips, I stood at the very back of the line and became well-acquainted with the rest of the un-numbered. Everyone seemed to want a piece of this talented, charming, funny man, so the line didn't move. After over an hour, we un-numbered finally took our first steps to the author. When we finally arrived at the promised man, it was more than worth the wait. 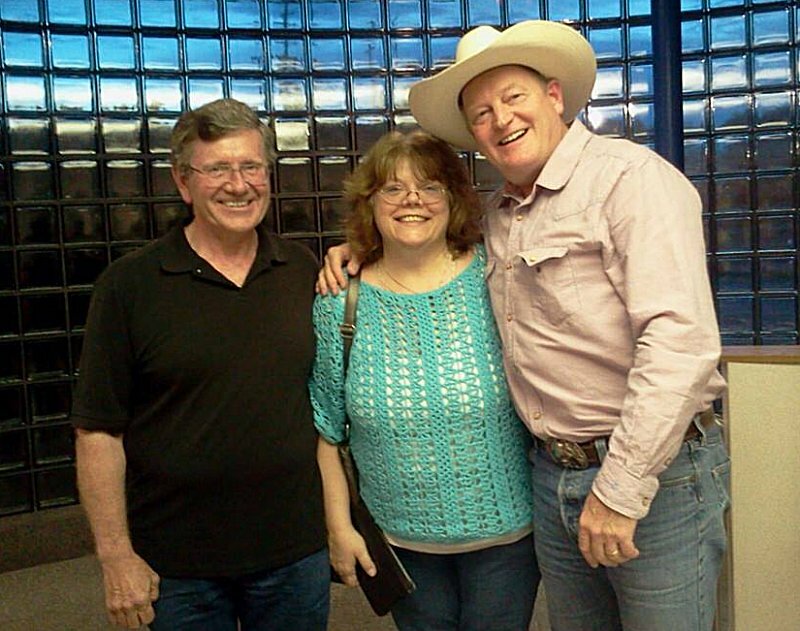 Two days later, Craig Johnson made an appearance in St. Louis, Missouri. My dear friend Jeanie (to whom I introduced Johnson's books) and her husband Frank were able to make the drive over there to meet him. Like Denis and me, they are both fans of Craig Johnson's books and the Longmire TV series. From the looks on their faces, they enjoyed themselves every bit as much as we did. 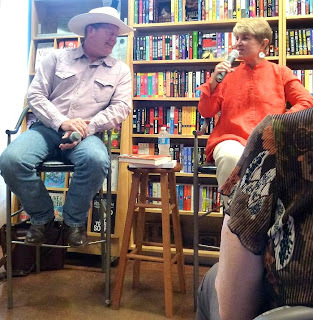 Jeanie said something to Craig about her friend in Phoenix who introduced her to his books, and Craig smiled and said, "Oh yes, the book blog lady!" Hopefully you'll be able to meet him, too. Craig Johnson is so much fun-- and don't get me started about his books! My face is the same shade as the lawn outside. *SO* envious. It sounds like a wonderful evening. I've signed up for Amazon to let me know when Longmire is out on region 2 dvd. Let's hope it's not too long as patience is not my strong point. Just reading book 3 and loving it. There are differences between the books and the TV series, but Denis and I still enjoy it. I hope you do, too (and that it's available soon)! I really must get on the "Longmire" bandwagon. I've been too caught up in big sports events so far but possibly when the college baseball world series is over . . . The talk he gave in St. Louis was much like the one you describe in Scottsdale. He is such a friendly, laid back person, we felt like we'd spent an evening with an old friend. I asked him if they were going to put Sancho in the television series and he said they are talking about introducing that character. I told him that, in my opinion, Santiago Saizarbitoria was one of the finest character names in all of fiction. He actually blushed! Since I listen to George Guidall's audio versions of the books, I had no idea how the name was spelled. 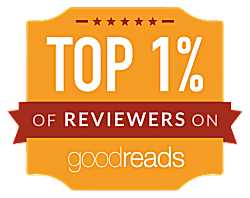 In fact, I thought it was Cesar (Spanish punctuation) Vitorio for a long time until I read a review where it was spelled. Hmmm. I really need to read one with my eyes to get the spellings in my head, I guess. Thanks to you I climbed on the Longmire bandwagon last year about this time. I got the first one just to see what you were talking about. I read it cover to cover stopping only to eat. I then promtly bought all the rest and read them one right after the other. When I finished I was depressed because I had no more books by Mr. Johnson. While the T.V. show is a tad different than the books it still feels like the books. Thank you for directing me to Mr. Johnson and a major thank you to Mr. Johnson for giving us Mr. Longmire. Bella, I can't begin to tell me how happy you made me by leaving this comment. Turning people on to good books is very important to me. Next time I want a picture of you and Denis with him. He sounds like a great guy! I can finally say what people used to say about my blog. Reading this post was almost like being there. I miss the Poisoned Pen so much. And, I've been going there for a long time to see Craig. Terrific post. Thanks, Cathy! You're welcome, Lesa. I'm so glad you enjoyed the post! Very good. I, too, am turning green with envy. Sounds like a great time was had by all at The Poisoned Pen.